Spring is here. It feels so wonderful to finally utter those words. After a winter that surpassed even Laura Ingalls Wilder's The Long Winter, I felt certain it would never arrive. Now that is has, it feels fantastic. The sun is rising higher in the sky, flooding me with warmth when it touches my skin. The trees may not yet have leaves, but the grass is starting to turn green and I feel like I can finally release a sigh of relief. Even though the nights have a sharp chill, the days are warm and for now that is all I need. After a Midwest winter lasting six months, this weather feels like a gift. When spring arrives, I am drawn to fresh fruits and berries. Even though the season for most of these fruits has not arrived, I cannot help but fill my red basket at the supermarket with them. After a long winter of apples and clementines, a burst of fresh flavor from a berry, however tart, is welcome to take up space on my counter top. After my last trip to the market, I found myself with a few cartons of blackberries. After playing around with a few desserts (and reminiscing over an old favorite), I settled on making a syrup. Though I did not yet know what it would smother, the scent of blackberries bubbling and boiling on the stove was too much to resist. I eventually settled on a plate of waffles. Waffles, just as pancakes, have the unique quality to fill a person up until dinner time rolls around. 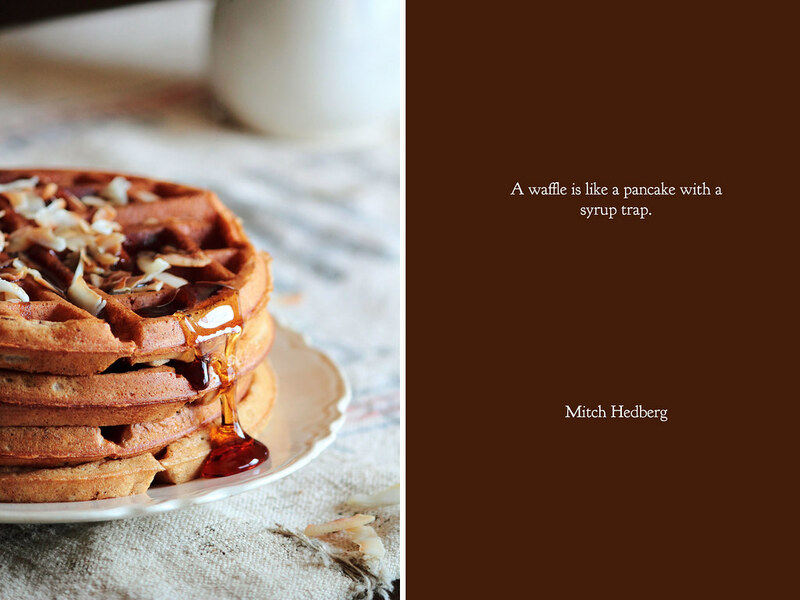 The heartiness of a good waffle, accompanied with a warm spring afternoon, make for a perfect combination. With these waffles, I added a few crushed almonds. While I found that they added a pleasant flavor and texture, you could certainly eliminate them if allergies are a concern. Drenched in blackberry vanilla syrup, these waffles were taken to new heights and made for a lovely Sunday brunch shared with the ones I love. 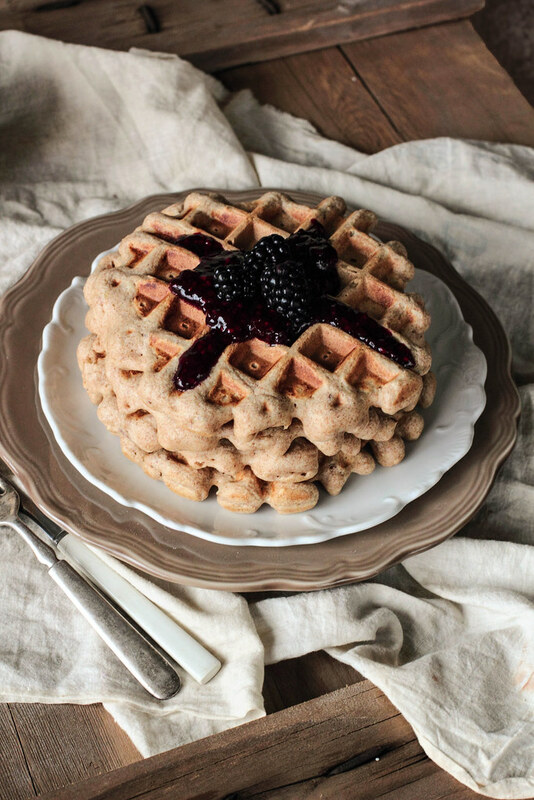 These Whole Wheat Almond Waffles with Blackberry Vanilla Syrup are sweet and grounded. 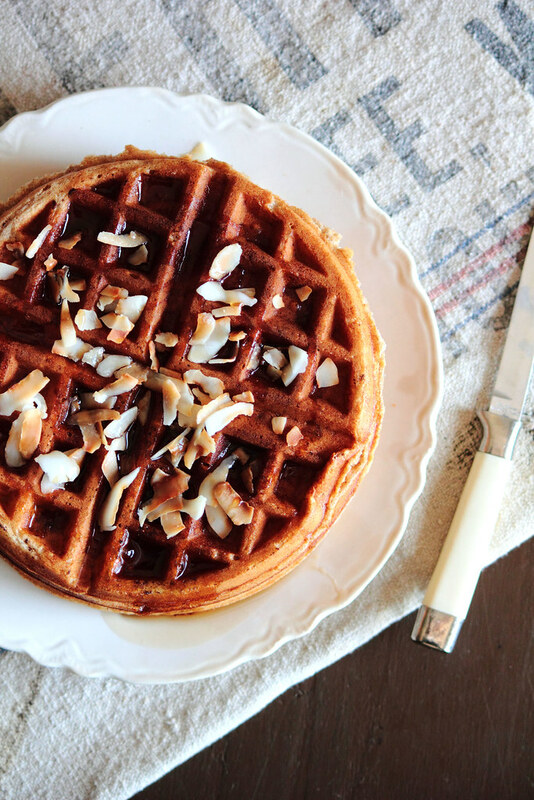 Crushed almonds are folded into a whole wheat waffle batter. The resulting waffles are fluffy and chewy. 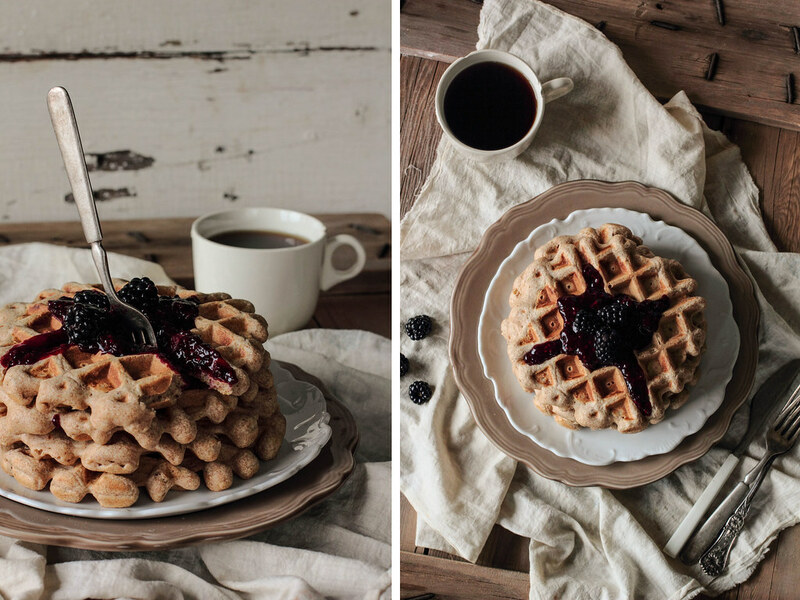 Drenched with a blackberry vanilla syrup, the waffles become fruity and bright. These are lovely for a weekend morning when you find a little time for yourself. Bonus: while cooking, the house fills with the scent of toasted almonds. 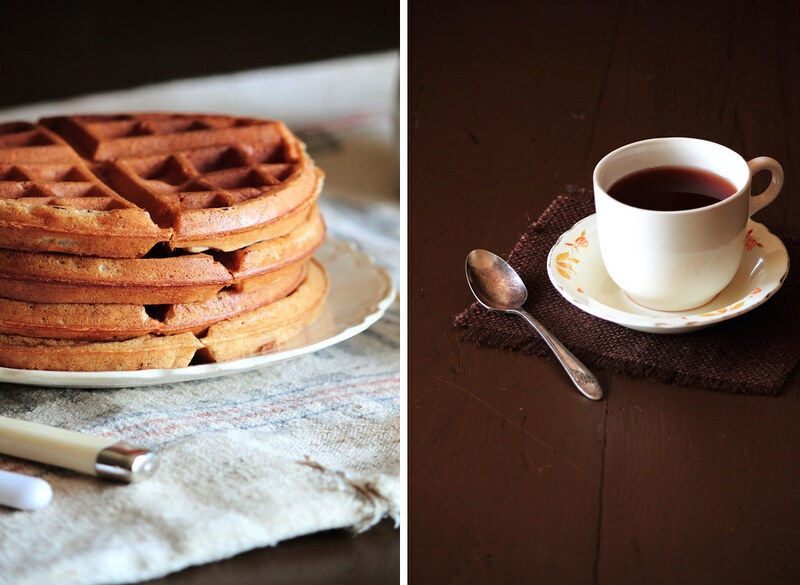 Waffles and pancakes have the power to heal. There is something about the thick batter and maple syrup that breathes life into bent shoulders and cures the woes of the soul. This past week has not been the best of weeks for me. There have been books, a career-defining exam, and a homemade stack of flashcards ever growing in height. There has been a car accident, a sore neck, and bent metal (but thankfully no real injuries). There have been insurance companies, a battered ego, and frustration trying to find new forms of transportation. When the world hands me trouble and strife, I make waffles. I wish I could say I always handle myself with grace under pressure and kindness under stress, but it isn't always the case. I often become selfish and inconsiderate during these moments, putting my own problems and worried emotions above others. In a way, it's a form of self-preservation; a coping mechanism to hold myself together enough to make it through a taxing afternoon. Even so, it doesn't excuse my behavior. I want to apologize to my boyfriend for yelling at him when he was only trying to help me study for my exam (I was just frustrated with myself, not you). I'm sorry I haven't been very pleasant this past week. Last Sunday I set aside time to make waffles—a brunch for two was on the menu. I needed a little comfort food to cure the aches of my week, fall spices to bring warmth back into my disposition, and pumpkin to remind me of the changing leaves outside my window. 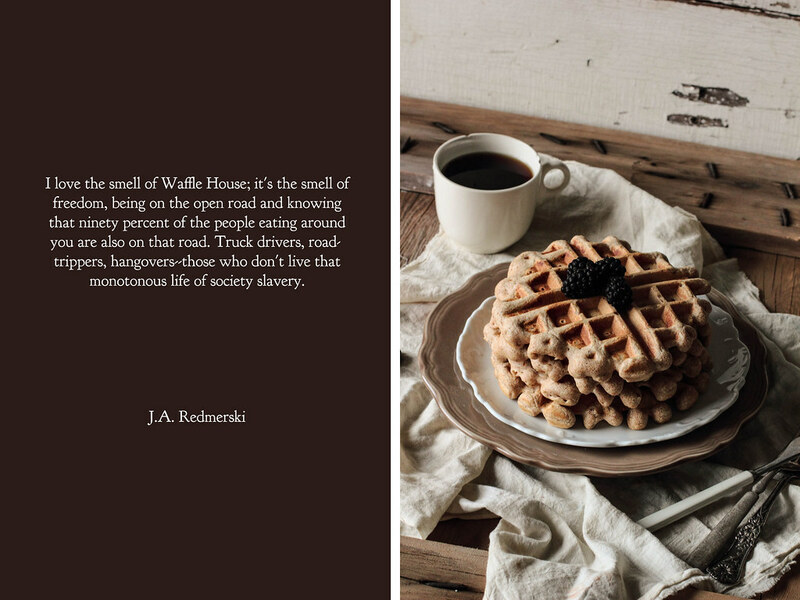 Even though waffles will never truly solve our problems, they can help us find a new perspective with which to approach them. Waffles and pancakes have the power to heal. They just need to be given the chance. 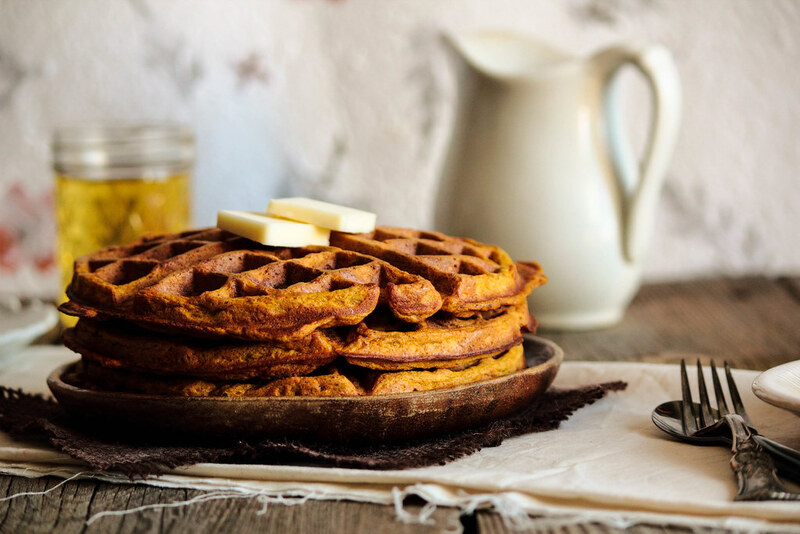 Pumpkin Waffles have a bright flavor and a seasonal draw. 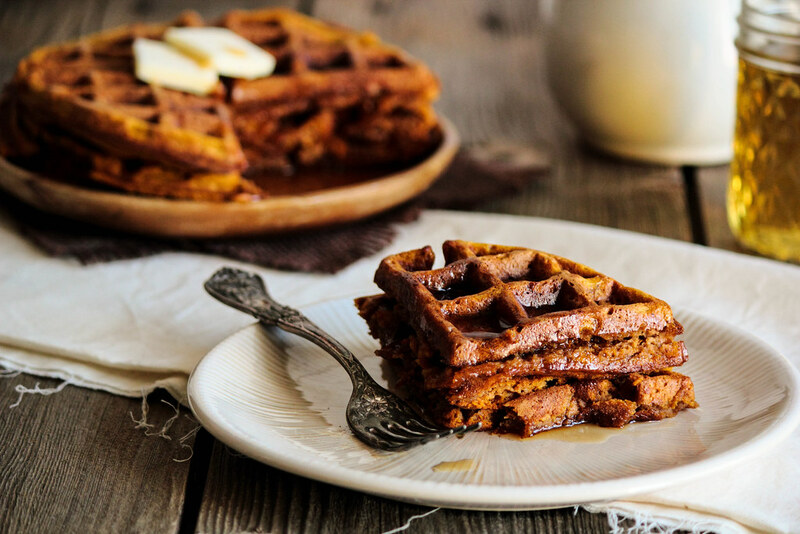 The waffle batter is thick, with plenty of cinnamon and spice to keep the flavors warm. 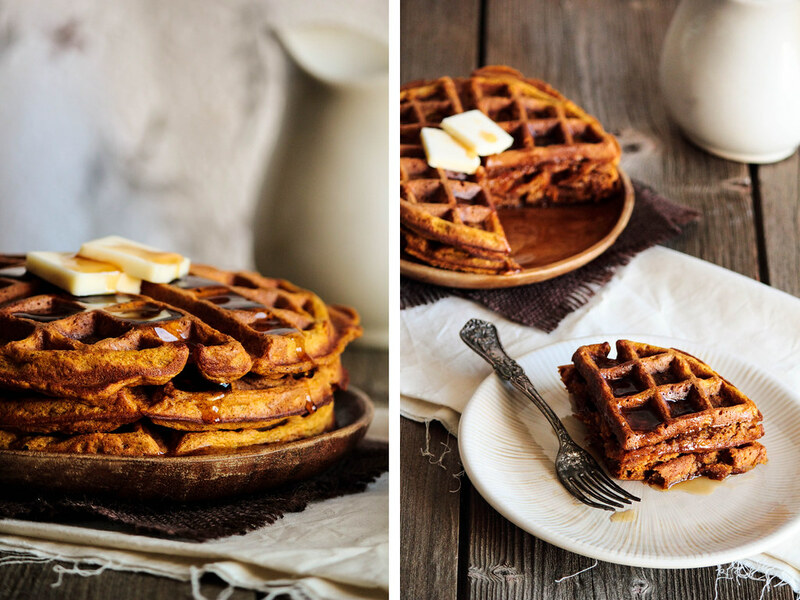 When the waffles cook up, the inside sets almost like a pumpkin pie, while the outside stays crisp. The waffles may need to cook a little longer to achieve this texture, but a few extra minutes on the clock are worth the final product. 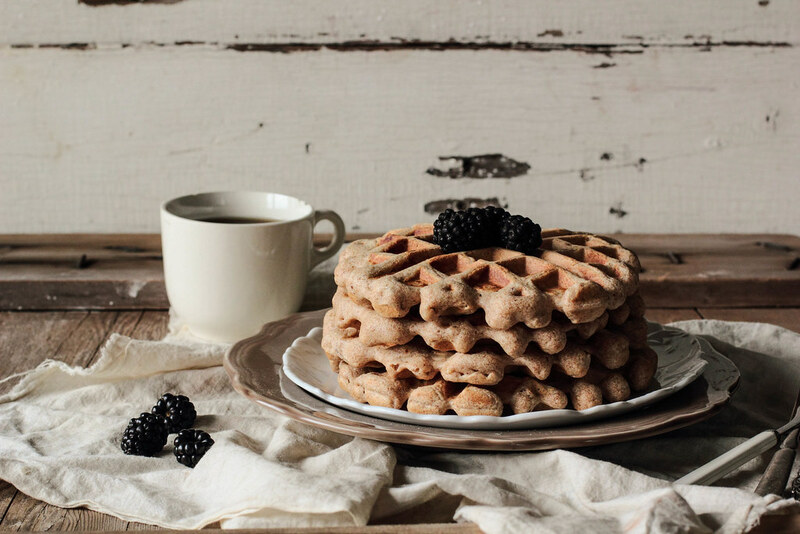 These waffles are a lovely addition to an autumn brunch. There is an adjustment period that comes with moving. Even after the belongings have found their way into closets, shelves, and onto living room walls, the new house is not a home. Not yet. It often feels like I'm a visitor who has come to stay, signed the guest book, but has yet to realize I'm not going to be leaving anytime soon. Adjusting to anything new takes time, as we all know, and there is little to do to hurry the process along. In the middle of cooking dinner, I often forget which cupboards and drawers I've put silverware or certain utensils and end up tearing apart half the kitchen just to find a spoon. In bed, I lie awake longer than usual, not used to hearing the foreign creaks and groans of a new building. I turn my key the wrong way in the lock, never sure which direction will lock or open the door. These are small things, certainly, but the extra moments I spend adjusting (and readjusting) the shower head or flipping on the wrong light switches leave me feeling like a guest in my new surroundings. Perhaps it is only when you've mastered the little things that you can feel as if you finally belong in the place you've chosen to be your new home. Sunday morning breakfasts are my favorite meal of the week for a hundred reasons, but mainly because it's one of the few meals my entire family sits down and enjoys together. Sunday brunch is full of comfort foods and loving people. After eating the past half dozen meals alone, in front of a computer screen, I needed to feel contentment that can only come from a Sunday brunch. At four o'clock on a Wednesday afternoon, I sat down on the floor with a plate of syrup soaked pancakes in my lap and flipped on a familiar re-run of my favorite sitcom. Somehow, it brought me closer to home. 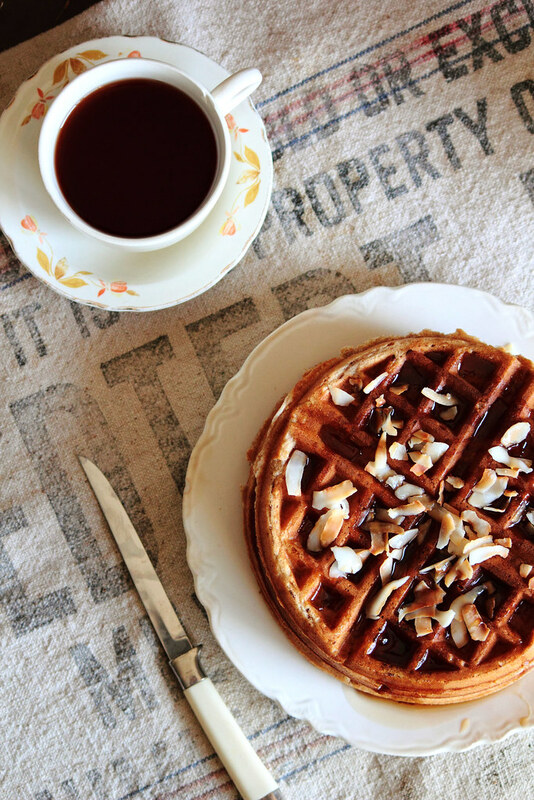 These coconut waffles have a subtle, comforting flavor. 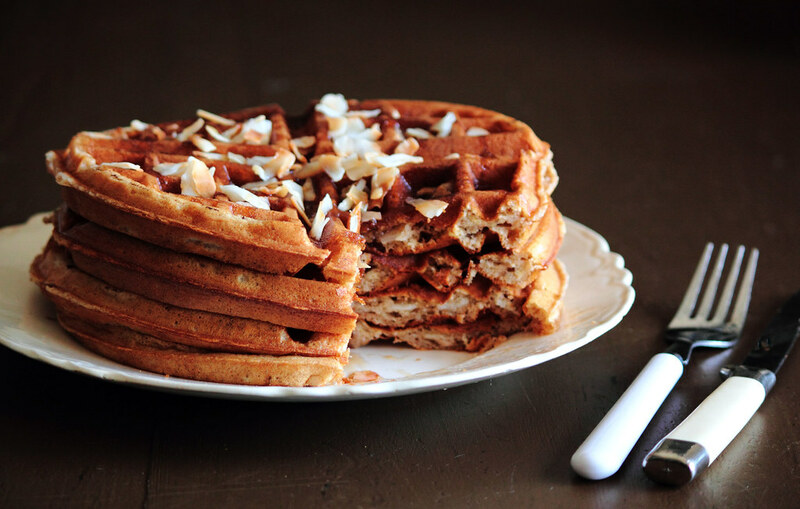 Whole wheat waffles are infused with coconut milk and flaked coconut pieces in the batter to bring in the delicate coconut flavor. 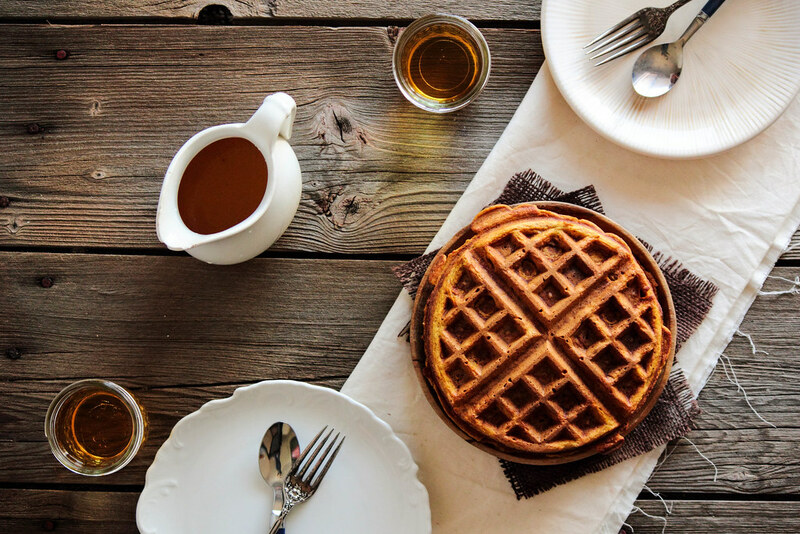 During cooking, the outsides of the waffles crisp up slightly while the inside stays soft. I prefer to top these waffles with flaked, toasted coconut and a little more maple syrup than is probably considered healthy. Whether it's Sunday brunch or a weekday afternoon, I hope these waffles bring you comfort, whenever and wherever you may be.